Yoga has enhanced my life in so many way — strength, flexibility, stress relief, confidence. I’ve taken private lessons with Holly regularly for nearly two years and my only regret is not starting sooner. She has helped me accomplish goals I didn’t even know I had. (She casually asked me one day if I wanted to learn how to do a handstand and within the year I was able to. It’s not perfect but I was starting from zero!) Our sessions are fun and the time flies by. If I’m ever stuck, unable to take a posture to the next level, she is brilliant at decoding what is holding me back. For years I’d been a runner, worked out in gyms, taken barre classes and hot yoga, but I never felt confident in a traditional vinyasa class. I didn’t understand the names of the poses and usually left feeling unsatisfied. That changed when I started practicing with Holly . She’s incredibly patient and positive — making the entire experience joyful. My sessions are the one time every week that I know I will learn something new, challenge myself, and feel totally uplifted afterward. Holly has improved my life. I started just less than a year ago and have come so far. She is genuine, knowledgeable, dedicated, encouraging and real. She meets you where you are with respect and gently pushes you to where she knows you can go. If you would have told me I would be doing backbends and headstands when I started just last March I would have laughed at you. In fact I did laugh at Holly but here I am doing them and working on more. Give yoga and Holly a try. You won't be disappointed. Holly has been fantastic for me as well with regards to beginning yoga. She truly understands the body and that some of us will be able to do somethings and others other things. She is always able to modify things appropriately for different students. I only wish I could go to her classes more often! Don't miss an opportunity to study yoga with this wonderful and genuine woman. I plan on trying to make it more often to her classes. I had never tried yoga before I went to Holly, but I have tried a number of other classes now, in different places and while others are also good, none compare to the expertise that Holly has and the individual attention she gives to everyone. I have greatly improved my ability to hold a plank pose and strengthen my core and upper body. Still need to improve my strength in these areas, but we are all a work in progress. The thing I miss the most now that I am back at work full time is my two times a week with Holly! While I have yet to figure out how to work back in to a yoga schedule, I have taken so much of what I learned from my time with Holly. I still stretch almost daily and often hear her voice - she's fantastic. Anyone wanting to really get a good start in yoga, go see Holly! I feel truly blessed to have discovered a yoga teacher as wonderful as Holly. Everybody has different reasons for practicing yoga, but no matter what yours is, Holly will help you to achieve it. 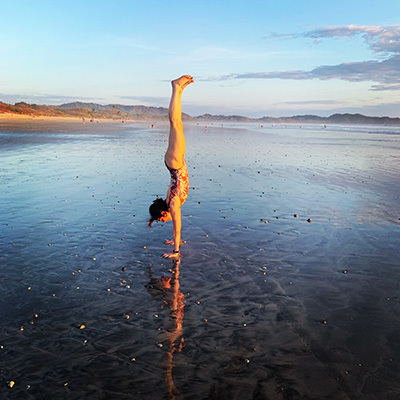 Her knowledge, experience and sensitivity to the many aspects of yoga combine to provide classes that are energetic, educational, inspirational, relaxing and fun - all at the same time! Thanks to Holly's instruction, kindness and encouragement I am healthier, more flexible and more in tune with my body than ever before. Holly attends to every student regardless of level or experience, humbly reminding us that yoga always has something to teach us. She clearly extends this philosophy to her own practice, which is beautiful to watch and continuously evolving. Yoga has been part of my life for many years and I have had many teachers. I don't think any of them have helped me go as deep as Holly. Holly does more than just direct us in class. She is intuitive. She gages where we are at that moment and leads us from there. She uses her own body and practice as example. She gives one on one to us when needed. No matter what level you are you can take Holly's class and feel comfortable. One thing is for sure with Holly, you will never get stuck. Holly lovingly encourages us to master our asanas. I personally have physical challenges and I have achieved yoga poses that I only dreamed of. My classes with Holly are one of the most important parts of my overall practice for happy, health living. My husband and I have been practicing yoga for about 15 years and are in our mid-60's. Holly is a fantastic yoga instructor. She modifies the directions to help the student at any age or level. Her explanations make the goal of each pose much clearer. She demonstrates what to do, but she also is comfortable adjusting each person in every pose. While practicing with Holly, my husband and I did new poses we had never done before and enhanced our flexibility. She is both spiritual and athletic so that your yoga practice is expanding all the time. We loved our year with Holly and miss her greatly! Holly's yoga classes have improved my life for the better. During the course of a year I have become so much more flexible and with her guidance I am able to do poses that I used to think were impossible. I feel so much calmer since she has taught me to breathe correctly and meditate. Holly has such a gentle and kind way about her and I appreciate the way she notices even slight improvement. I never thought I’d look forward to jumping out of bed at the crack of dawn three times a week to take a yoga class, but with Holly, I can’t wait to hit the mat! She is knowledgeable, has a charming sense of humor and is very committed to her students. With her ever-patient guidance, I continue to improve and can do poses that I had once thought were impossible. She never gives up on us. I’m so grateful to have a teacher like Holly. Holly is a one of my favorite yoga teachers! Her knowledge and motivation kindness and care never ends. I'm so excited that we have a chance to challenge ourselves in every practice with Holly. We have an opportunity to grow and get stronger. I'm in my 50s and I can do poses i've never imagine I could have done. For me, it is a challenge to go upside down , I have some fears... but I' m getting there...thanks to Holly. If you’re looking for a fun, energizing yoga class then you have to come to Holly’s class. It doesn’t matter if you are a beginner or an experienced yogi she will work with whatever physical level you are at and teach you to do poses you never thought you could do. She will challenge you in the nicest of ways and always makes sure you are having fun. Don’t be surprised if you find yourself upside down or twisted and loving it! Holly is a gifted teacher and perfect for ANYONE looking to start Yoga or for a more advanced class and or private teacher. She is incredibly talented in teaching and her knowledge of all things Yoga & diet is unparalleled! In closing, THANK you Holly for all you have done for my health, flexibility, balance, strength and wisdom !!! Holly is an absolutely wonderful yoga teacher- her class is both energizing and relaxing at the same time. Watching her in the poses is beautiful and awe inspiring- and after taking her class, I find myself able to do things in yoga I never thought I could do, even though I’ve been taking yoga classes off and on for the last ten years. I always feel comfortable, even when trying something new- and her positive and supportive attitude creates a safe environment to do just that. I look forward to each class, and I can’t recommend her enough. I've been a runner for almost 20 years and I find Holly's class a perfect compliment. Running tightens up your hamstrings and quads, and her classes have helped loosen them up but while also creating a lot of upper body strength. She tests and pushes me in a fun and imaginative way - always great to do one of Holly's classes! Holly is a patient teacher and her knowledge of her practice extends beyond just yoga poses. She cares about her clients and takes time to learn what their focus and motivation is. For me, aside from getting in shape and at her suggestion, I tried yoga to combat my sleep issues. After years of not being able to sleep, after many,many different remedies, natural and prescription, it turns out all I needed was yoga. I truly believe that Holly's care and guidance helped me get on a steady sleep pattern (and I don't look too bad either)! Experiencing Yoga at work is amazing for creativity! I was not a Yogi type of person at the beginning of the year, but now once a week we practice yoga with instructor Holly Skodis and it is amazing! I'm very active and my mind is more relaxed, especially when I design at work. It is also a calming and a health-promoting practice that offers myriad advantages for body and soul. As individuals benefit, the company wins as well, because the sense of joy and well-being students feel in their classes is associated with the employer providing them that nurturing experience. Now I can say that yoga has become a part of my life.